Can Pregnant Women Eat Mangosteen? Mangosteen, a tropical fruit native to Thailand, contains a thick purple skin and inner segments of juicy flesh. 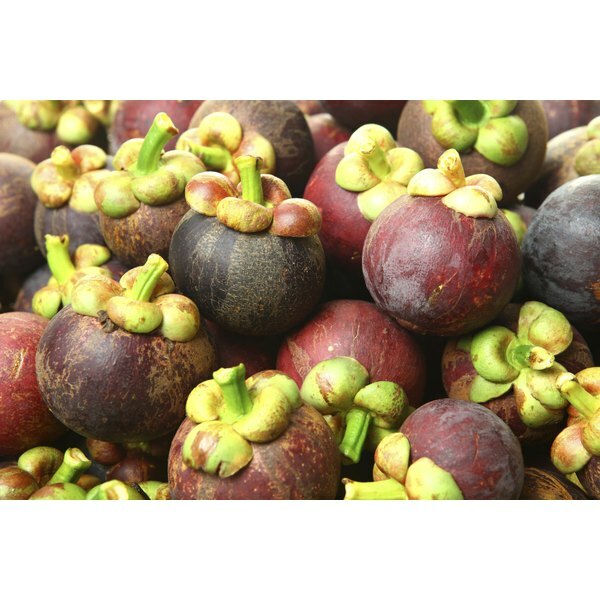 A nutrient-dense food, mangosteen provides vital vitamins and minerals that may be beneficial during pregnancy. Avoid using medicines made from the rind of mangosteen, however, as no studies have been conducted on the safety of powdered mangosteen rind, which is often used for diarrhea relief in pregnant women. Pregnant women should consult a physician before including mangosteen in their diets. One cup of mangosteen fruit contains 61 micrograms of folate; it is recommended that women include 400 micrograms of folate in their diets each day during pregnancy and while trying to conceive. This vitamin may play a role in preventing certain birth defects; the U.S. Centers for Disease Control and Prevention notes that folate may decrease the risk of spinal and brain birth defects by 50 to 70 percent. Folate may also increase the risk of having a child with other defects, including cleft lip and palate and certain heart defects. Mangosteen fruit is a good source of the mineral manganese -- 1 cup of this fruit provides 0.2 milligrams. When pregnant, the body requires 2 milligrams of manganese per day, which the growing fetus needs to help form the skeletal system and cartilage. The manganese in mangosteen has antioxidant properties that help protect both the mother and the fetus from cellular damage. Both a pregnant woman and her fetus need vitamin C, and mangosteen provides it. One cup of mangosteen contains 5.7 milligrams, a small portion of the 85 milligrams of vitamin C a pregnant woman requires each day during pregnancy. Vitamin C keeps the immune system healthy, lowering the risk of contracting infections that may damage the fetus. This vitamin also promotes the production of collagen, the compound that makes the skin elastic, an important factor when skin stretches to accommodate a growing baby. The American Pregnancy Association indicates that over half of all pregnant women experience constipation during their pregnancies. Eating mangosteen may help alleviate this uncomfortable condition due to its fiber content -- 1 cup of mangosteen fruit has 3.5 grams of fiber. Women require 25 grams of fiber per day to ward off constipation. In addition to fiber's effectiveness for avoiding constipation, it may also reduce the risk of pregnancy complications such preeclampsia, a condition marked by high blood pressure that occurs due to diet, genetics and blood vessel problems. How Healthy Is Pear Juice?